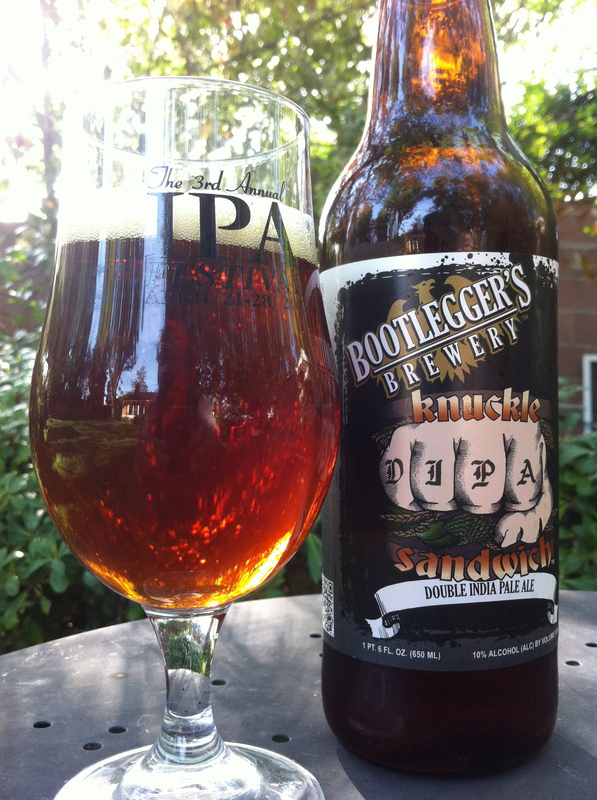 KNUCKLE SANDWICH is a seasonal release from Bootlegger’s Brewery. This Imperial IPA has 87.8 IBUs and a 10% ABV. This is a beer that truly lives up to it’s name! Brewed with copious amounts of North American hops, this double IPA has a colossal hop profile and an aggressive aroma. Helping round out the floral and citrus notes is a huge malt backbone that provides a great mouthfeel to this heavyweight hitter. There’s something about the deep amber/copper color you get from a good Imperial IPA that makes me very excited. With Knuckle Sandwich here, if you held the glass at the right angle this color almost looked like a red wine. A half-inch of taupe foam leads to some mild, but persistent lacing. As I said before my main memory about this beer was the abundance of grapefruit flavors/aromas in this beer. This is why I was a little taken aback to be bombarded by a big whiff of pine at the forefront of the nose. This pine needle flavor quickly melds into a bouquet of sweet fruits and citrus flavors. Amongst these, huge notes of grapefruit and tangerine jumped out at me. Hints of lemon, oak, and alcohol were also picked up as well. This is still one of the best smelling IIPAs on the market. The taste isn’t quite as good as the nose leads you to believe, but it’s damn close. Oak-soaked pine hops start off each sip. This transitions into a sweet grapefruit and mandarin orange center, before ending with a touch of caramel malts and brown sugar. After the beer warms up a bit these notes tart to meld together into a flavor I like to call “awesomeness”. Mouthfeel is surprisingly thick for an Imperial IPA. Carbonation bubbles dart around your cheeks as you drink this beer down. Massive amounts of stickiness is left over, but it’s not as annoying as it is with other beers. It’s almost like a fond memory of sips past. 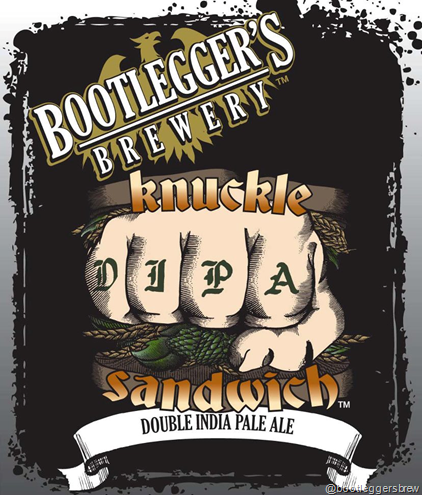 Knuckle Sandwich is a beer I wish I had more access to. Sadly it’s only a limited release and comes but once a year. This beer was the first IPA/Imperial IPA that I can recall that really accented the grapefruit-like hops. Although the grapefruit isn’t as big in the taste as I remember, this is still a helluva beer.